John L. Rury and Kim Cary Warren, eds. Sitting atop Mount Oread, the University of Kansas stands as a monument to the determination of the state's earliest settlers to build for the future. As a "city on a hill," the university has also mirrored both American society's hopes and its fears—and never has this been truer than over the past five decades. Transforming the University of Kansas chronicles the many accomplishments and the daunting challenges that marked the last half-century at the University. 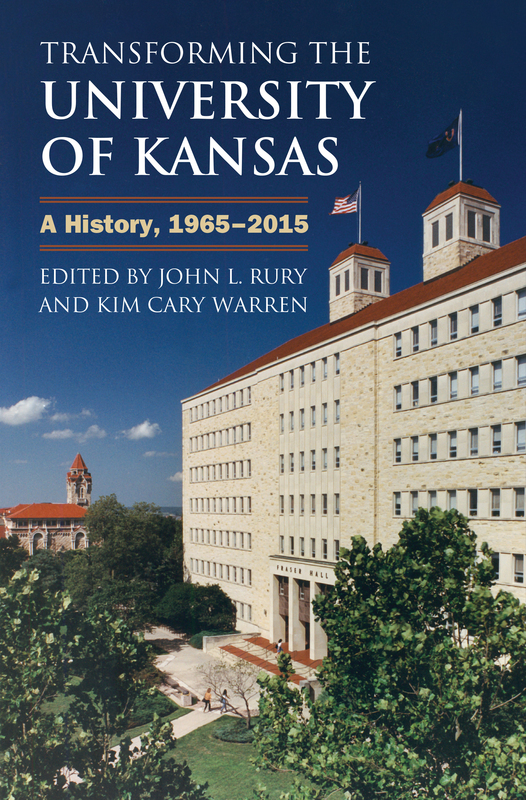 On the eve of the sesquicentennial anniversary of the school's founding, this book reflects upon the people, politics, and developments that have transformed KU since 1965, making it the distinctive institution of higher learning that it is today. Like major universities across the country, Kansas became a global research institution in these years, a leader in academic inquiry and scholarly expertise. It also experienced a wrenching process of change following student protests demanding greater rights and recognition. The authors—all experts from KU's faculty or staff—focus on particular aspects of the era, documenting major changes that occurred and introducing key leaders. Organized in three broad categories—leadership and politics; teaching and research; and students, protest, and sports—these essays draw upon a wealth of archival material, including interviews and yearbooks, student publications, and alumni sources, to create a full and richly textured picture of growth and change over five decades. These essays detail the school's transformation from a bucolic college into a sprawling university, capturing the personalities and spirit of each of the eight chancellors who have guided KU through these challenging times. The essays describe innovations in learning, from the liberal arts through international studies and graduate research. And they reveal the changing character of student life in curricular and extra-curricular activities, in campus activism, scholarship, and athletics. Together the essays comprise a living portrait of the university, broad in scope and vivid in detail, growing and adapting to a rapidly changing world, prepared to meet the challenges of the new century. John L. Rury is professor in the School of Education and the Department of History at the University of Kansas. Kim Cary Warren is associate professor in the Department of History at the University of Kansas.